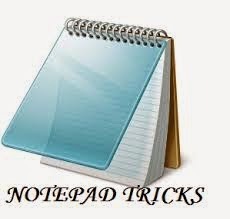 Notepad is one of the best platform for editing the text, anything can be written with any type of extension, Today i will share some most useful and interesting tricks of notepad. This trick is called Matrix effect trick. Now copy and paste the following code. Now save the file with .bat extension type. Run the .bat file,Then you will have matrix Effect on your screen. This trick is called Keyboard Dancing Led. Now cop and paste the following code. Now save the file name as dance.vbs (where vbs is an extension you must include). Run the dance.vbs file then you can see your keyboard lights are blinking like dancing. First go to task manager(ctrl+alt+del). Now exit the program named wscript. Make a simple virus, this is very dangerous trick, if you open this file you may lose all files from C drive or any specified Drive below (don't do this). Now save the file name as virus.bat (.bat is an extension, you must include). This is World trade center attack trick. The flight number of the plane that had hit World Trade Center on (9/11) was Q33NY, Coincidentally it has become an amazing trick. Now Copy and paste the following text. Now change the font size to 72 and font to wingdings. Other tricks will be added soon So, keep visiting.